I found this on my computer the other day. 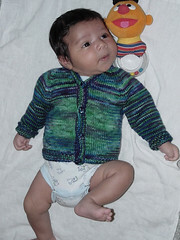 That's my nephew, wearing the "Satin Grape" cardigan I knit him with superwash from Danette Taylor. Ain't he the cutest? 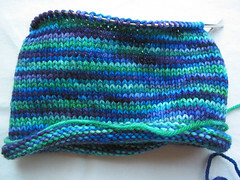 The pooling on this project was fantastic, I Loved it. The center front are the lighter colors, and the center back is dark purple, like he sat in... (Scott named it with specific spelling). Looks like the smallest size was maybe too small; I know he was eating good. I'm 12 for 16 gifts for the holidays, this will make 13! Another is in progress, and 2 yet to be started. We're a New Year's celebrating kinda folk, so I've still got time. So I keep telling myself.